The ‘sharing economy‘ has crept up on policy makers. Perhaps best known are Uber and Airbnb. Conservative cabinet minister Eric Abetz says Australia should not legalise gay marriage because no Asian country has adopted marriage equality. And Senator Abetz says legalising gay marriage would lead to polyamory and argues issue should be rejected out of hand because Opposition Leader Bill Shorten supports change. Hockey’s proneness to mistakes matters well beyond issues around the housing bubble. It’s not just that he has been a serial creator of problems for the government. It’s also that this is a particularly challenging time for the economy, which requires a treasurer who’s seen both as competent and as in touch with ordinary people’s situations. Politicians rate poorly in public esteem, as in fact do journalists and the press. Do you have to have a reputation before you can be defamed? 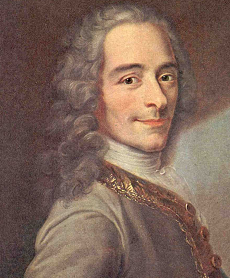 Is it possible to defame a politician? Does anyone place any reliance on what the press say anyway? I suspect Hockey has done himself some damage by pursuing Fairfax for defamation. Most people don’t read Fairfax, but I’m sure now most people know that he’s been up to something that caused comment. His lawyers think too that the process has harmed him. They are after maximum damages for what was published, plus extra for the way Fairfax conducted the case. Essentially they are saying that Fairfax lawyers continued their “smear campaign” against Hockey in court. Fairfax lawyers say their cross-examination of Hockey was “properly conducted” and “robust” but did not “cross any boundaries”. The golf experience will carry on. The Palmersaurus Dinosaur Park, Motorama auto museum and Palmer Grill restaurant will remain open during redevelopment. A large proportion of the accommodation was time-share. Investors are out of luck, at least for the time being. This ABC report was positive about refurbishment and new investment, but the TV news on Thursday was negative, suggesting it had plain gone bust. I keep expecting the whole Palmer phenomenon to blow up in a puff of smoke. According to Roy Morgan, Mike Baird will win comfortably on 28 March, 55.5 to 44.5 for the ALP. In Queensland, however, the ALP under Annastacia Palaszczuk would go down 49-51. However, Palaszczuk is the preferred premier, and for the first time more men (56%) prefer her. Overall she wins 61-39 over Lawrence Springborg. In Victoria the ALP under Daniel Andrews is surging and would win 56-44 over the LNP. Cyclone Nathan slammed into the coast north of Cape Flattery, with winds at Cape Flattery in the Category 3 classification. Cape Flattery is well north of Cooktown. The indigenous community of Hopevale, 49 km northwest of Cooktown, was the nearest polulation centre and received no destructive winds. Even their banana farm, flattened by Cyclone Ita last year, escaped this time. Cyclone Ita hit Cape Flattery as a Category 4 system and mauled Cooktown. This time they escaped. Cyclone Pam, however, is regarded as one of the worst natural disasters in the history of Vanuatu, and is up there as one of the strongest cyclone ever in the Southern Hemisphere. I’ve borrowed the title from The Australia Institute because it reflects how I feel about the Intergenerational Report. Stated crudely, these are: first, that Labor’s policy settings would have taken us to hell in a hand basket; second, that but for the pesky Senate, the budget would have been in good shape relatively soon; and third, that despite the obstacles, the government is making progress towards bringing us to fiscal health. The Intergenerational Report is accessible here. See also the ABC article and The Conversation’s panel of experts. The Report paints three scenarios. The first dubbed “Proposed Policy” is the Abbott Government’s 2014 Budget. It would bring a surplus within five years. That is, if the revenue stream holds up as predicted, which we know it hasn’t. Also some ‘saves’ of the budget have been abandoned. That’s the first bit of fiction. The second scenario is termed “Currently Legislated Policy”. 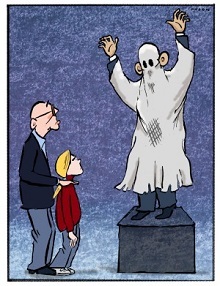 That’s what the Opposition, the Greens and crossbench senators have passed. That will lead to a deficit of 6% of GDP in 2055. The shock horror is in the third scenario, called “Previous Policy”. We are meant to believe that this is what the LNP inherited from Labor. In 2055 on this scenario the annual deficit would be a whopping 11.7% of GDP, with net debt at 122% of GDP. The deception here is that the Report has not used Labor’s legacy as reflected in the Pre-Election Fiscal Outlook (PEFO) prepared independently by Treasury and Finance and published under the charter of budget honesty in August 2013 before the last election, which had the budget coming into surplus in 2015-16. 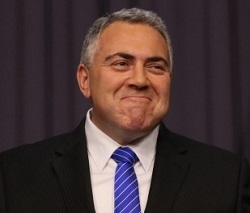 It has used Hockey’s first Budget Update, after he had added billions of dollars of debt. The IGR is a document compiled by the Treasurer, not the Treasury. Chris Bowen says that Labor would legislate to have it compiled by the Parliamentary Budget Office to take out the politics. The Report has put in some scary figures like number of centenarians will grow from 5,000 or so now to almost 40,000 in 2055, spending on aged care and pensions will from from 2.9% of GDP to 3.6%. That’s an increase of 24% when our average income is forecast to lift from $66,400 today to $117,300, or 76%. If that is true (I have my doubts) then we can live very decently and still afford welfare. A really scary figure given is the dependency ratio, which is the number of people of working age (15-65 year-olds) to aged people (65+). The dependency ratio is 4.5 now and will reduce to 2.7. Again I say, why should we worry that the number of workers is reduced by 45% when each worker will be earning 76% more. * People retire become eligible for age pensions at 65. There is no sign the government even recognises the most serious threats to future generations: liquid fuel security, climate change, water shortages, loss of productive land and loss of biodiversity. These issues require planning and commitment of resources now. Rapid population growth to reach 39.7 million is taken as a given, not something we have a choice about. Climate change is the dominant geopolitical fact of the future. It will shape the future more surely than tax takes or pension liabilities. It will reshape the global economy, threaten food yields, increase natural disasters, lay waste to Australia’s region and generate hundreds of millions of refugees. Such blunt realities are absent everywhere from the 2015 IGR. It’s denial writ large, pure and simple. A larger blind spot – a more willful inapprehension of reality – is hard to envisage. You don’t have to take such shoddy work seriously, and as a busy citizen, you shouldn’t. The Intergenerational Report is not a serious attempt to make projections about government policy. It is an ornament, a prop in a policy theatre, a bell-and-whistle for the next Treasury lockup. Like most such reports, the IGR will be quickly forgotten. Update: The Parliamentary Library site Flagpost has a useful comparison of the four IGR reports so far. They tell us lies, but are they clunkheads? There are two possible explanations for how an opposition presenting itself as an alternative government could end up with an $11 billion hole in the cost of its election commitments. One is that they are liars, the other is that they are clunkheads. Actually there is a third explanation: they are liars and clunkheads. at where the PEFO numbers leave the LNPs budget task and finds that, at best, $25 billion more in ‘saves’ will be required. She was commenting on the competence of the Joe Hockey/Andrew Robb team. Robb has of course since been replaced by Mathias Cormann. the economy was “heading in the right direction”. He wanted “to build on the achievements we made in 2014”. It’s weak and it’s bleak. It isn’t heading “in the right direction”. Hockey and Cormann will tell you that while unemployment is growing, employment is too. The Reserve Bank points out that monthly hours worked have scarcely changed since December 2011 despite three years of population growth. They barely moved at all in 2014. Hockey told us the poorest Australians “either don’t have cars or actually don’t drive very far in many cases.” They do. Petrol is a bigger part their budget than it is for the rich. his own wealthy electorate of North Sydney had “one of the highest bulk-billing rates in Australia”. Make that one of the lowest in Sydney. 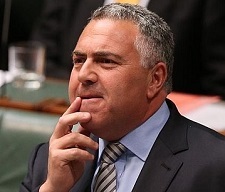 Hockey said that typical Australians pay nearly half their income in tax. They don’t. Even those on $200,000 pay only 36%. 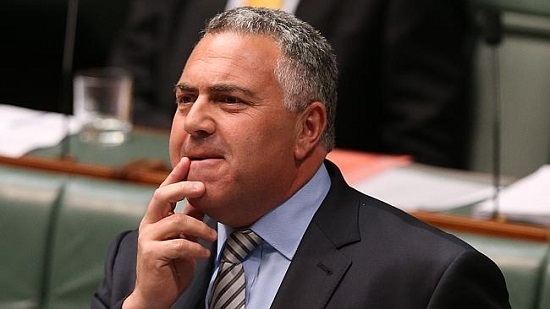 Hockey said Australia was on track to run out of money to pay for its health, welfare and education systems. The figures put forward by his then health minister suggested otherwise. In ten years the cost of Medicare had climbed 124 per cent, the cost of the Pharmaceutical Benefits Scheme 90 per cent and the cost of public hospitals 83 per cent. But Australia’s gross domestic product – the money we would use to pay for these things – climbed 94 per cent. Trust has evaporated, and without trust consumers and business lack confidence, which has been sliding since September. Specific businesses are at a standstill. Universities don’t know what fees they will be allowed to charge, students enrolling don’t know what fees they will eventually be asked to pay, doctors don’t know what will happen to their incomes, electricity generators don’t know what will happen to the renewable energy target, big businesses don’t know whether they will be hit with the 1.5 per cent paid parental leave levy and what it will be used for. Focussing on the budget, Alan Austin at Independent Australia finds a revenue megafail, all of the government’s own making. This comes on top of the earlier post in which Austin found 40 expenditure items where money was wasted. Such as the Italian Carrara marble panelling Defence is putting in a Canberra building, to take one at random. On the revenue megafail, Austin says, all were Coalition decisions, the deterioration has been dramatic, we got precisely the opposite of what was promised, it will take a treasurer and finance minister with a high level of competence, courage and authority to restore the situation, and finally, as the experiences of Spain, Ireland, Hong Kong, Venezuela and other countries show, damage done to an economy in a short time can take decades to repair. The Abbott Government inherited the best-performed economy in the world in 2013. Some say the best the world has seen since data collection began. Within nine months, however, ABC Fact Check confirmed deficits for the forward estimate period had doubled over Labor’s level. 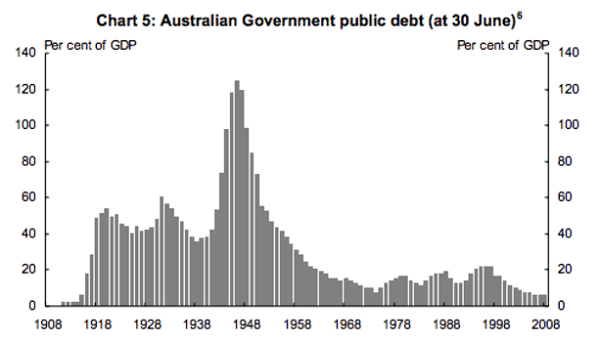 Now, after 17 months, net government debt has increased over Labor’s by 34.6%. It’s on track to have doubled by this time next year. I think the initial question about liars and clunkheads answers itself. Chris Bowen promises us a warts and all budget narrative. We’ll have to wait and see. Meanwhile Hockey is setting up to scare us to death with the intergenerational report. 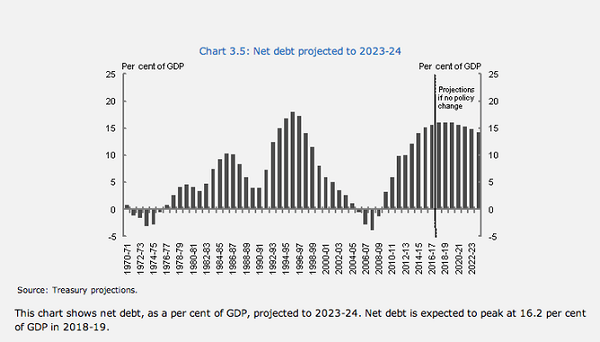 Hockey’s debt and deficit mess. Hockey: dark strategy or a muddle? Some of each, I think. In one sense the MYEFO (Mid-year Economic and Fiscal outlook) statement was not so bad. The bottom line is $10 billion worse and the budget will reach a surplus a year later, in 2019 instead of 2018. Ross Gittens gives Hockey a tick for not panicking. Yet the MYEFO assumes that the Senate will co-operate in the new year and pass all those lovely cuts to higher education and welfare benefits along with other measures like the GP visits co-payment scheme. Laura Tingle finds little to show that the Government has a clue on what to do about the collapse in revenue from the terms of trade and long-term fiscal consolidation. It’s blindingly obvious that we need to pay more tax, but the Government has taken the soft option of soaking the unseen poor by taking $3.7 billion from foreign aid. Ben Eltham in an excellent budget review finds the Coalition’s economic policy “hopelessly confused”. The first plank, revealed in the 2014 Budget, is an attempt to tilt income distribution towards the already well-off. The idea is that, given enough breaks, the rich will save and invest, providing employment for everyone else. It’s a policy based on heroic assumptions about how the rich behave, most notably an assumption that rich people are rich because they are clever and industrious. Suffice to say that this was the disastrous approach known as “supply side economics” or “Reaganonomics” in America in the 1980s. If it stimulates any employment it is likely to be among workers in BMW car plants in Bavaria and real-estate agents in Sydney’s north shore. The Australia Institute’s report The budget’s hidden gender agenda points out that this also favours men over women. The second plank is about sustaining material living standards as long as possible on the back of the resource boom. The benefits of the resources boom have been distributed in tax cuts and middle class welfare. Wayne Swan in his book The Good Fight points out that Peter Costello received a total of $334 billion in revenue upgrades and managed to spend $314 billion of it. A once in a century chance to upgrade our infrastructure was missed. The Coalition’s third plank is pursuit of “small government”, even though Australia has one of the smallest public sectors of all developed countries, and we have pushed privatization to the extent that we are paying far more for poorer services than we would be had we retained public ownership of assets such as roads, airports and energy and water utilities. With spending at 25.9 per cent of GDP, the Abbott government is indeed spending more than Julia Gillard’s government – more, in fact, than every year of the Rudd-Gillard era, except the stimulus year of 2009-10. I’ve always thought there was an ideological dimension to Howard-Costello’s distribution of goodies. We are expected to take more responsibility for ourselves. But why does Labor follow suit? Purely for political reasons, I think. To avoid the ‘big spender’ tag and demonstrate economic management. Labor might do better to take a different and more honest approach. Australia could become a better, fairer and more decent place to live if we taxed and spent to, say, 30% of GDP. We’d still be near the bottom of the league tables. You’ll notice that Swan had the balance down almost to minus one percent before Hockey came and created a mess. I agree with Chris Bowen, Hockey is simply not up to the job. 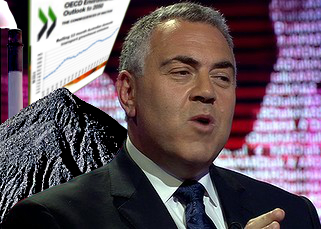 On one view Treasurer Joe Hockey made an absolute goose of himself on the BBC’s HARDtalk program the other day. A kinder view is that Hockey and the interviewer, Stephen Sackur, were simply talking past each other. Sackur was talking about greenhouse emissions, Hockey was talking about coal exports. The question remains open as to whether Hockey understands the difference. In terms of the question he was actually asked, he was talking gibberish. Right, you sell an awful lot of coal in Asia and that raises questions about Australia’s commitment to cleaning up its act. You are one of the dirtiest, most greenhouse emitting countries in the OECD group of developed countries. Is your Government prepared to do anything to clean up its act? Well firstly, the comment you just made is absolutely ridiculous. Well, Australia is a significant exporter of energy and in fact, when it comes to coal, we produce some of the cleanest coal, if that term can be used – the cleanest coal. (Inaudible) Highest per capita emitter of greenhouse gases of any nation in the OECD. So, what is wrong with what I am telling you? You are a very polluting nation and you have got a decision to make as a Government about whether you are prepared to do anything serious to change that. Stephen, I don’t accept the basis of your question, and why? Because we’ve got a small population and very large land mass and we are an exporter of energy, so that measurement is a falsehood in a sense because it does not properly reflect exactly what our economy is. We are on the threshold of becoming the biggest exporter of gas in the world. We are a major producer and exporter of coal. We are now selling uranium to India. We are an exporter – a trustworthy, reliable, predictable exporter of energy that is helping to drive the emergence of the middle-class in Asia. Now, that should be welcomed. He goes on to say that the best way of tackling climate change is to help developing countries become richer, and to do this they need to burn more coal. The fundamental point is this: that we are asking Australians to pay an extra 40 cents a week in fuel taxes on average, in order to deliver the biggest road building program in Australian history. Didn’t he promise Christine Milne that the extra funds would go on public transport? Seems she was right not to believe him. HICCUP Hockey strikes again! Just when colleagues were starting to think the Treasurer might be getting his act together he produces another gaffe. Oakes’ story was written before the BBC interview. 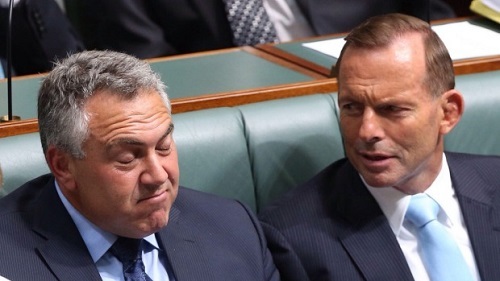 Hockey’s was attempting to use national security to pressure Bill Shorten over Hockey’s stalled budget bills. Oakes termed this an appalling misjudgement. “If Bill Shorten truly is honest about his commitment to deliver bipartisan support in relation to our defence efforts in the Middle East, he’ll provide bipartisan support to pay for it,” he said. That time Abbott hastened to distance himself and to set the matter straight. Shorten was a true patriot, he said. This time, well you never know, he may agree with Hockey, being ignorant about climate change himself. Or perhaps he hoped we didn’t hear. That applies to the whole pack of them, Abbott and his front bench, with perhaps one or two notable exceptions. Richard Denniss at The Conversation takes a look at Menzies’ approach to debt financing. Robert Menzies left Australia in far worse financial shape than he found it, at least according to current treasurer Joe Hockey’s favourite debt and deficit benchmark. 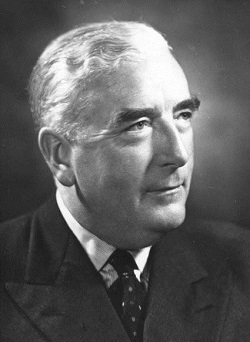 Having inherited budget surpluses from the Chifley Labor government, the Menzies Coalition government ran small budget surpluses from 1949-50 to 1957-58. But then Menzies’ “irresponsible profligacy” began, running budget deficits for the last nine years of his reign. Menzies was interested in nation building rather than obsessing about budget deficits. So, what was Menzies up to? He clearly wasn’t obsessed with the budget deficits or worried about numbers of public servants that so concern Hockey. The economy grew quite steadily, often growing at more than 6% in real terms. Unemployment was mostly around 2% or less, and only 1.6% when he retired. Over his time in power, you couldn’t even argue that Menzies was trying to balance the budget over the business cycle. Menzies was interested in nation-building. He not only wanted rapid population growth, but he wanted infrastructure growth and growth in the health and education services that make a society both cohesive and productive. Like any successful corporate leader, he was willing to use long-run debt financing to fund long-run investments. Menzies knew that a lot of his budget spending was for capital projects that would deliver benefits for decades, so why should he have funded them entirely out of one year’s revenue? Hockey, on the other hand, wants to fund a big increase in infrastructure spending with no increase in tax and no increase in debt. He wants to fund more capital spending by cutting spending on essential services and income support for poor people. The simplistic notion that a deficit is evidence that a government is “living beyond its means” is complete economic nonsense. Leaving aside that historic and international evidence provides no support for the claim that budget deficits cause long-run economic problems, the argument is contradicted by the corporate decision making that politicians pretend to emulate. Government ministers are fond of household and corporate analogies. It is perfectly normal for a family to borrow money to buy a house, up to 27 to 30% of annual income. Corporates that do not have debt of 30 to 60% of net worth are said to have ‘lazy’ balance sheets. Unless they take on respectable levels of debt, growth prospects are usually minimal. Parents of a school wanting to build a swimming pool or other optional facility typically need to borrow money otherwise they will never get the use of the facility while their kids are at school. Where would Brisbane be without the Story Bridge? According to Wikipedia the successful tender was ₤1,150,000. From memory the debt was finally paid off in 1997, when the payments were actually negligible. Hockey, Abbott, Cormann and company take us for fools, insult our intelligence and generally carry on in a reprehensible manner! They are not acting in the national interest. See also Hockey’s debt and deficit mess. Joe Stiglitz certainly knows how to make a point, as he did to Fairfax Media in calling our budget changes to health and education “absurd” and a “crime”. He did this on the basis of the relative performance of our system as against the USA. In health, for example, America spends twice what we do as a percentage of GDP for three years shorter life expectancy. 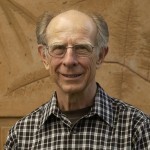 Two big lessons of economic research over the past 10 years are that inequality is not the result of inexorable laws of economics but rather of policy; and that countries that adopt policies that lead to high inequality pay a high price – inequality not only leads to a divided society and undermines democracy, but it weakens economic performance. I think he [Piketty] is absolutely right to emphasise the increase in inequality that has occurred. I think he is absolutely right in his key idea that the period from World War II to 1980 was unusual in the history of capitalism, capitalism has typically been associated with high levels of inequality. What I differ with is I don’t think it is the inexorable result of economic laws, of economic forces. It is a result of policies and politics, it is the result of rent-seeking behaviour, which the laws and regulations help create or don’t do enough to counter. There is almost a tone in his book that this is just the way of capitalism, and my view is that the kind of inequality that we’ve seen is really a result of the fact that we don’t have a well-functioning market economy. So to Stiglitz markets are a human artefact and need regulation, and the nature of laws and regulations governing markets matters. As do state provisions and interventions. While there are many dimensions to growing inequality, perhaps the most invidious is inequality of opportunity. Western democracies pride themselves in providing a level playing field, in which all who would work hard can prosper. But it’s a myth, and nowhere more so than in the US, in spite of the rhetoric about the American dream. The life prospects of a young American are more dependent on the income and education of his parents than is the case in other advanced countries. And there is a vicious circle: inequality of outcomes leads to inequality of opportunity which leads to further inequalities of outcome. The prospect for America’s future is thus still more inequality of outcomes and opportunity. Stiglitz says that only about 8% of those in the bottom half of the income scale get a college education. He says our Australia’s HECS system works and is the envy of the rest of the world. But Australia is neither the best nor the worst in terms of equality. In his article in The Guardian he compares our Gini coefficient unfavourably with that of Norway, a resource-rich country that has done a particularly good job of managing its wealth for the benefit of all citizens. He links to the OECDiLibrary. I can make more sense of the CIA Factbook which places Norway on 25 and Australia on 30.3, close to the European Union average of 30.6. The USA looks third world at 45. On the one hand we are the best in the Anglosphere, with Canada on 32.1, the UK on 32.3 and New Zealand on 36.2. On the other, we are worse than half of Europe. almost one out of four children living in poverty, and with deficient public support, the prospects for their future are not rosy – and this will inevitably translate into weaker overall economic performance for the country. In Stiglitz’s ideal world one’s opportunities are not constrained by the circumstances of birth. Society should help individuals to become whatever they can be, which is in turn better for society and the economy. In Hockey’s world society gets you to a mythical starting line from which reward is dependent on individual effort. Social support is not universal. The social safety net has holes in it through which fall the unworthy. I sense that for Stiglitz freedom and equality are integrated through a sense of justice, as for John Rawls. Full individuality is attained in a cooperative and mutually supportive social context. This contrasts with the individualistic competitiveness which seems a leading feature of Hockey’s world. One day listening to Radio National I did hear about research which purported to show that societies with a Gini coefficient of 33 or more tended to become socially dysfunctional and corrosive. Unfortunately I did not get a name or a link. It seems to me, however, that the sense of outrage felt towards Hockey’s budget stems from the sense that it is taking us as a society into territory where we feel that the social contract between the people and the state has been breached.